Caucasian region is the motherland of various dishes that include meat. Georgians even say that real men must eat meat at least once a day as if only meat nourishes body with all the needed vitamins and organic elements. It may be just a gossip but you can find it yourself by just looking through the menus of most Georgian restaurants. Despite being deep meat lovers Georgians cook an abundance of different vegetable dishes, make so called ‘kompot’ (stewed fruit drink), cook special sauces and astonish travelers with always full of fresh products baskets in the shops and markets. Lots of tourists do not trust the place known as ‘bazaar’ situated near Station Square Metro because it looks differently from clean and cozy markets in their motherland. Bazaar is the largest place where merchants sell different kinds of fruit and vegetables, fragrant greens, savory spices, Georgian cheese, meet in all its possible variations, and sometimes even livestock. When you enter the open space you can see people selling products in any kind of weather. Any people say that this place is a real disgrace as it looks unsightly and untidy. Despite lots of criticism there are some ‘buts’ in connection to this place. First of all, this place sells products for a lower prices compared to chains of big supermarkets. 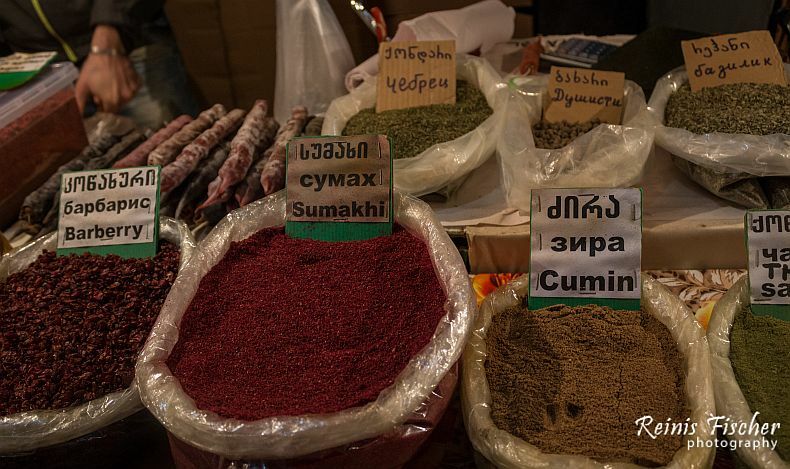 Another advantage of bazaar is that all products are Georgian that do not contain pesticides and are non-GMO. You may be perplexed at some point when you see the products but the main rule to remember is that if food looks extremely pretty, as if it was painted – it is non-organic. Organic food in Georgia may look not in the way we are used to see it, but the taste and its favor are really great. Another rule to remember when buying food either in bazaar or in the streets – bring your own scales. Merchants might play tricks on you with their broken scales that give wrong information. Actually, Georgian government is struggling against street trading but still you can find many people standing (even in main streets) with their baskets and sacks of fruit and vegetables under the open sky. Products are even cheaper in smaller cities like Borjomi, Telavi, Akhaltsikhe and others. People organize Bazaars in special places and all of the products are easily approachable so that’s why the prices are a little bit lower there. The guarantee that food is organic and fresh is close to 100% mark. Those who prefer eating out and cannot bear the thought of fast food and greasy dishes can find lots of different cafes and restaurants that serve organic and fresh courses. Vegetarian cafes have become popular in the more recent past where you can taste dishes cooked with non-gluten and eco products. One of the most densely-attended places is family café ‘Barbarestan’ that serves exclusively organic food. Lots of people fall in love with this place from the first bite and highlight politeness of the waiters. You can be taken on a tour to wine cellars where you can hear a wonderful story of the eco establishment. The menu served at the café includes mostly traditional Georgian dishes but in a new unprecedented format that astonishes the locals themselves. You can even taste a secret-receipt ice-cream which has been concealing its ingredients for 104 years. The place is situated in 132, Aghmashenebeli Avenue and also holds live music concerts every weekend. Another place to visit is g.Vino though be prepared to spend a little bit more here. The place is mostly visited for organic wine and not only. 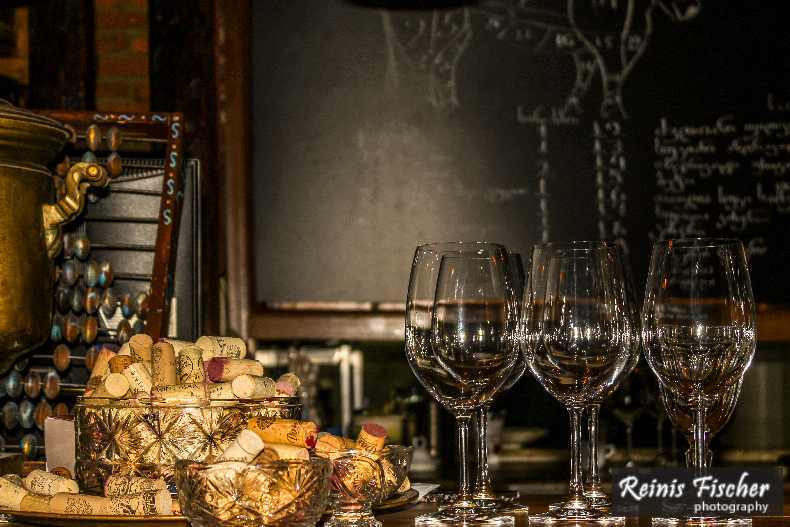 If you once try wine at g.Vino you will start looking for the same flavor in your country – the staff as if knows what to suggest and how to satisfy your tastes. It is really difficult to find an empty table but you will be surprised to see people waiting for others to finish their courses. The address of the place is 6, Erekle II Street. Kiwi Café is famous for its sensationalism as all liberals gather at this place. You can feel the vibes of pathos there as the founders of the place tried to make the café 100% vegetarian and are absolutely proud of their preferences. 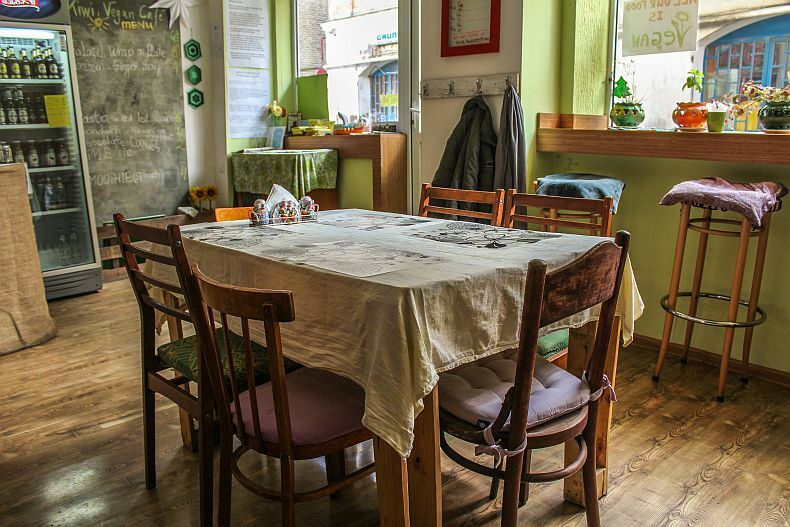 The place serves the best falafel in Tbilisi and offers various kinds of organic food including tofu, vegetable stews, mushrooms, fresh fruit smoothies and many-many other dishes. It is situated close to Liberty Square, 6, Machabeli Street. Orangery Restaurant is among the top-organic places that serves both Georgian and European cuisines. The ambiance is extremely pleasant as you are surrounded by the green trees, as if the place itself is ‘organic’ and you are far away from the city. Orangery is the place where taste competes with the service and beauty of the table setting. This place is popular with families who have small children as there is a play room designed for children. You can relax at the restaurant and try eco-clean food. You can find this place in 13, Mosashvili Street. The place where the name speaks for itself is Organique Josper Bar in 4, Shardeni Street. The courses vary from non-gluten dishes to salads and from stakes to chopped cutlets. This is one of the rare places where fresh fish is cooked with a refined taste. You need just one glance to fall in love with the shapes and varieties of courses that are indeed anesthetically pleasing, but when you have just a bite you understand that this is the place you’ve been searching for in Tbilisi. Also don’t forget to taste waffles! They are baked right there and leave a nostalgic aftertaste of the place. Those who like to raise vegetables and fruit themselves can try online sources like Bio Organic Georgia LTD where one can purchase fertilizers produced of vegetable wastes. You can apply it to the damaged parts of the roots or just improve soil properties. When coming to Georgia you will find yourself on an unexpected gastronomy tour that helps you to forget about the junk food and mere burgers, no matter how tasty they may be. Food and products sold in Georgia are mostly organic but still one has to see into the interior kitchen of purchase and sale. Still, it is difficult to be disappointed in the food that you try in Georgia and that’s why help yourselves in this beautiful and unique country!